In most other parts of the Park Lands, the Park name corresponds with a Park number, and the number has been consistent since the 1890s or earlier. This Park is different. Although it was marked as Park Lands in Colonel Light's map of 1837, it took more than 100 years before the people of Adelaide started treating it as a Park. Although it was marked on 19th century maps as “Section 6027” the Park number “27” came into use only in the 1960s. From 1837 up until the late 1950s this area was used and abused for many purposes, and rarely resembled a park. Bonython Park or Tulya Wardli is only one part of Park 27, an area that includes a biomedical precinct, railways, Police Barracks, historical Gaol, and car park. This trail is centred on the area known as Bonython Park/Tulya Wardli, which is about 17 hectares. The Bonython Park Kiosk overlooks the Torrens River and Linear Park Trail, and is intended to service the adjacent children’s playspace. 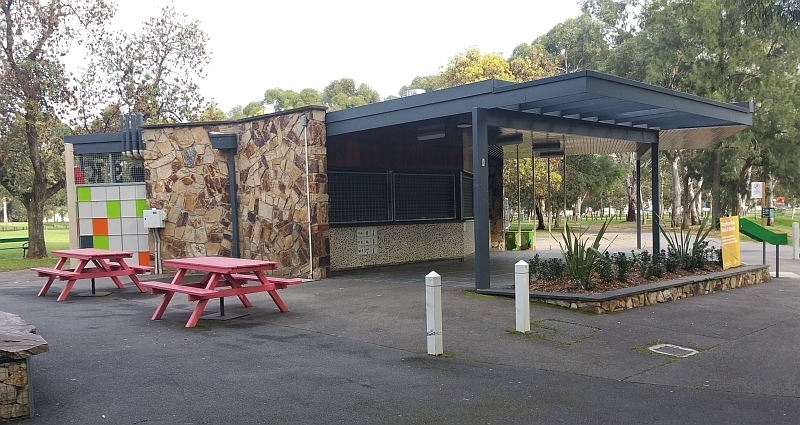 Adelaide Park Lands Preservation Association, “Introduction - Bonython Park Kiosk,” Adelaide City Explorer, accessed April 24, 2019, https://adelaidecityexplorer.com.au/items/show/344.